Dr. Hallmark is chair of the Institute of Transportation Engineers Safety Council and a member of the Transportation Research Board Traffic Control Devices Committee (AHB50). She has conducted numerous safety analyses to assess the impact of roadway countermeasures. 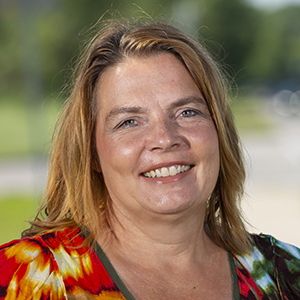 She has served as principal investigator for five projects using the Second Strategic Highway Research Program National Driving Study (NDS) data for safety analyses. Each project entailed utilizing large naturalistic driving and roadway datasets. Three projects used the NDS data to assess the relationship between driver behavior, roadway factors, environmental conditions, and likelihood of a roadway departure. She has also evaluated the crash and safety impacts of paved shoulders, the Safety Edge, low-cost rural curve treatments, rumble stripes, intersection lighting, stop sign beacons, and chevrons. Dr. Hallmark has also worked on a number of projects that have developed workbooks, guidance documents, and other technology transfer material. In order to develop these materials, she has worked with end users such as state departments of transportation, county and local agencies, trade groups, and enforcement groups. Hallmark, Shauna L., Yu Qui, Neal Hawkins, and Omar Smadi. 2015. Development of Crash Modification Factors for Dynamic Speed Feedback Signs on Rural Curves. Journal of Transportation Technologies, January 2015. Hallmark, Shauna L., Neal Hawkins, and Omar Smadi. 2015. Evaluation of Dynamic Speed Feedback Signs on Curves: A National Demonstration Project. Federal Highway Administration, Washington, DC. Hallmark, Shauna, Nicole Oneyear, Samantha Tyner, Bo Wang, Cher Carney, and Dan McGehee. 2014. SHRP2 S08D: Analysis of the SHRP 2 Naturalistic Driving Study Data. Strategic Highway Research Program 2, National Academies, Washington, DC. Isebrands, H.N., S. L. Hallmark, and W. Li. 2010. Safety Impact of Roadway Lighting at Rural Intersections. Journal of Transportation Engineering. Vol. 136, No. 11. pp. 949–955. Isebrands, H. and S. Hallmark. 2012. Statistical Analysis and Development of Crash Prediction Models for Roundabouts on High-Speed Rural Roundabouts. Transportation Research Record: Journal of the Transportation Research Board, No. 2312, pp. 3–13. 2012 Patricia Waller Award: Outstanding Paper on Safety and System Users. Gkritza, K., C. R. Kinzenbaw, and S. Hallmark. 2010. An empirical analysis of farm vehicle crash injury severities on Iowa’s public road system. Accident Analysis and Prevention. Vol. 42, No. 4, pp. 1392–1397. Hallmark, S., M. Orellana, E. Fitzsimmons, T. McDonald, and D. Matulac. 2010. Evaluating the Effectiveness of an Automated Red Light Running Enforcement Program in Reducing Crashes in Iowa using a Bayesian Analysis. Transportation Research Record: Journal of the Transportation Research Board. No. 2182, pp. 48–54. Mueller, K., S. L. Hallmark, H. Wu, and M. Pawlovich. 2007. Impact of Left-Turn Phasing on Older and Younger Drivers at High-Speed Signalized Intersections. Journal of Transportation Engineering, Vol. 133, No. 10, pp. 556–563. Hallmark, S., N. Hawkins, O. Smadi, C. Kinsenbaw, M. Orellana, Z. Hans, and H. Isebrands. 2008. Strategies to Address Nighttime Crashes at Rural Unsignalized Intersections. Iowa Department of Transportation, Ames, IA. Isebrands, H., S. Hallmark, Z. Hans, T. McDonald, H. Preston, and R. Storm. 2006. Safety Impacts of Street Lighting at Isolated Rural Intersections – Part II. Minnesota Department of Transportation, St. Paul, MN. Hallmark, S. L., E. Fitzsimmons, H. Isebrands, and K. Giese. 2010. Evaluating the Traffic Flow Impacts of Roundabouts in a Signalized Corridor. Transportation Research Record: Journal of the Transportation Research Board. No. 2182, pp. 139–147. Khattak, A. J., M. D. Pawlovich, R. R. Souleyrette, and S. Hallmark. 2002. Factors Related to More Severe Older Driver Traffic Crash Injuries. Journal of Transportation Engineering, May/June 2002, pp. 1–7.